Flux Inline Water Boosting Systems by Pearl by Calpeda Pump includes a water pump and an electronic controller which are used in residential applications when it is necessary to boost the city water pressure. They are easy to install, require no scheduled maintenance, do not need a pressure tank on most installations and include protection against running dry. 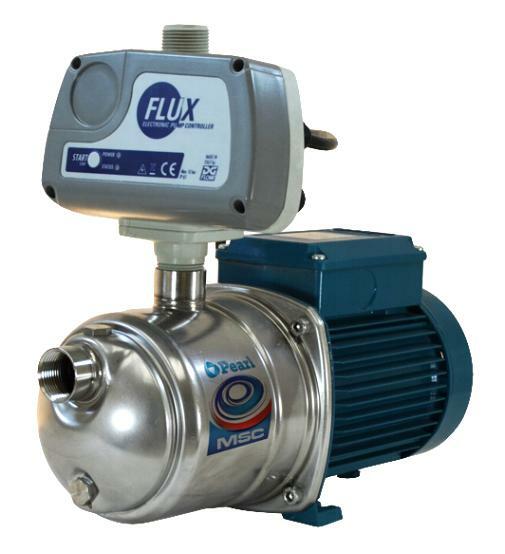 Presflo Well Boosting Systems by Pearl by Calpeda Pump includes a water pump and an electronic controller which are used in residential and irrigation applications when it is necessary to boost the city water pressure. They are easy to install, require no scheduled maintenance, do not need a pressure tank on most installations and include protection against running dry. Used only to pump from wells NOT for inline boosting. Pearl by Calpeda Presflo Deluxe Inline or Booster Well Systems include a water pump and an electronic controller with built-in water accumulator tank which are used in residential applications when it is necessary to boost the city water pressure. They are easy to install, require no scheduled maintenance, do not need a pressure tank on most installations and include protection against running dry.